The team from BCIT’s Tourism Marketing Diploma Program was crowned the winner of this year’s provincial Winning Pitch competition at the BC Tourism Industry Conference today. 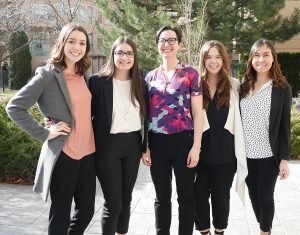 This year, student teams from around BC developed a business concept for a new tourism product or service that expands into and supports the development of shoulder- and off-seasons of the tourism industry in their respective regions. 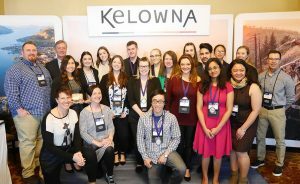 Fourteen teams from eleven post-secondary schools presented their four-page concept paper to an industry judging panel at regional competitions held in Kamloops, Nanaimo, Vancouver and via online submission. The winner from each regional competition met at the provincial finals, held at the BC Tourism Industry Conference yesterday. The finalists presented their full business plans to over 100 conference delegates and a panel of judges including James Terry from Partners in Tourism Society, Marsha Walden from Destination British Columbia, and J.J. Belanger from Crystal Cove Beach Resort. Conference delegates had the opportunity to vote for their favourite business pitch, which contributed to the overall score. Second place went to the Thompson Rivers University team with their proposal of “42 Eau Resort & Spa”, a high-end rejuvenating escape combining cannabis and wellness in a sustainable resort near Lac le Jeune. Third place was the Selkirk College team with their proposal of “Kootenay Lake Rail Tour”, utilizing existing railway infrastructure to provide guided dining tours by train between Nelson and Cranbrook. The VIU team took home fourth place with their proposal of “Nanaimo Bar Festival”, an affordable event creating exposure for local businesses, easily replicated in other regions of Vancouver Island.